Kristy joined our team after teaching high school Biology, Anatomy, Chemistry, and Physics, and later on, serving as the Director of Special Education Services. Addressing teacher burnout is crucial to retaining high quality educators. Explore prevention and solutions for teacher burnout here. 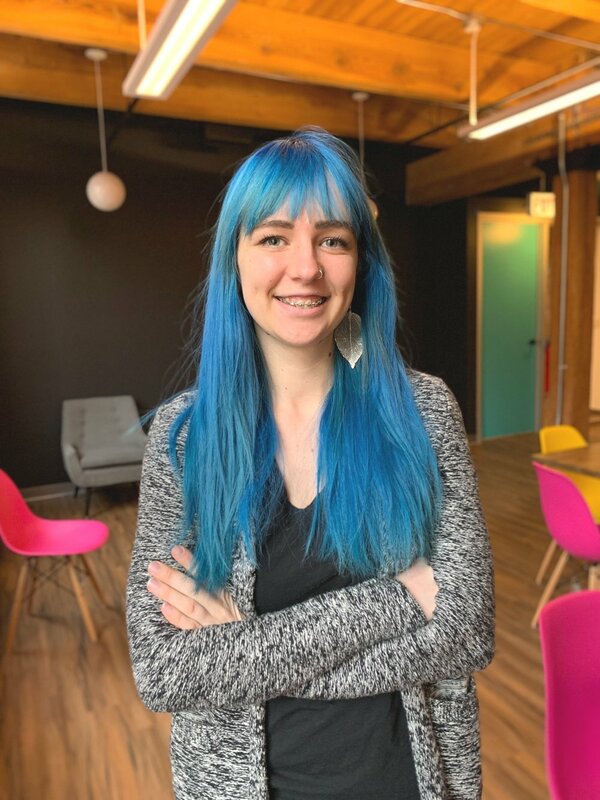 Hollie Lambert joined The Graide Network as a full time software engineer in January, 2019. You can read more about Hollie’s first month at The Graide Network on her blog, or keep reading to learn more about her. Where are you from and how long have you lived in Chicago? I’m originally from the Big Island of Hawaii, the largest island in the Hawaiian chain. I grew up in the jungles of Puna which was one of the main areas covered in lava during the 2018 Kilauea eruption. I attended the University of Hawaii at Mānoa and majored in Women’s Studies, focusing my studies on gay, lesbian and trans-identity issues, sexual assault prevention and reproductive justice. I moved to Chicago in the summer of 2018 to attend Fullstack Academy. After graduation I was selected for a fellowship and remained with the software engineering program for three additional months as a teaching assistant. I’m currently experiencing my first polar vortex (also known as Chicago winter) and missing the sunshine. What drew you to join The Graide Network? I was homeschooled as a child and attended a public high school in Hawaii with over a thousand students. I spent most of my childhood reading as many books as I could check out from our local library and entering writing contests for short stories and poetry. I participated in a young writers club and posted my creative writing online where others could review it. As a high school and college student it was often difficult to get that detailed, actionable feedback on my writing because I was in such large classrooms with so many other students. When I learned what The Graide Network’s mission is I immediately recognized the problem, and the company itself was exactly what I was looking for - a startup that is having a positive impact on the world. What unique skills or perspective do you bring to the team? I grew up in several different countries and had the fairly unique experience of being homeschool which gives me a different perspective on education. I spent five years working for the Hard Rock Cafe interacting with dozens of people every day which taught me excellent communication skills and how to remain calm in high pressure situations. As a software engineer, I’m at the very beginning of my career which means technically I have an infinite amount still left to learn. I was also briefly in a circus as a child so if our team is ever in need of unicycle riding abilities or aerial fabric acrobatics I’m here to save the day. What are you most excited/interested to work on? The best part about being early in your career as a software engineer is that currently everything is interesting and exciting! In my first few weeks I’ve been focusing on getting familiar with the tech stack that we use because it’s different than what I’ve worked with before. I’ve written unit tests, updated linting issues, fixed bugs and constructed SQL database queries for our internal Metabase dashboards. I’m currently mostly working on behind the scenes stuff and I am looking forward to building features that our Graiders and teachers will use. I enjoy observing and participating in the real world product development of something that provides value to others. What do you hope to learn in the next 6 months? In the next 6 months, I hope to get a solid foundation in the front and backend technologies we use. In my first week I felt like I wanted and needed to learn everything at once which was unrealistic. I currently feel comfortable figuring things out independently and then asking for help when I need it but hopefully I’ll continue to get better and better at debugging issues on my own. I’d also like to understand our product and company more holistically and be able to contribute more during our meetings. On the weekends I’m usually hanging out in a coffee shop or in a thrift store. I can spend an entire afternoon listening to podcasts while hunting for hidden treasures in thrift stores. I try to read at least fifty books a year, mainly nonfiction. I like going to yoga classes in the morning and attending interesting talks after work, usually focused on tech or feminist issues. Interim assessments can be a strong tool to measure student performance. Learn more here! Analyzing teacher attrition trends by location may help uncover solutions for improving retention rates. Explore teacher turnover rates by state here. We are excited to welcome Fridaouss to the team! Her passion for education reform and stand-up comedy skills are only some of the great things about her. Read on to learn more about new our Sales Associate and her big plans for growth and impact at The Graide Network and beyond. Meet Eileen Dominic, the newest addition to The Graide Network family. She'll be taking over as Member Success Manager this summer. You can learn more about her journey as an AmeriCorps Teaching Fellow and her work at Citizen Schools Illinois. We're so excited to have her onboard and hope you'll join us in giving her a warm welcome! "After four years of teaching, I can attest to the fact that your most important function in your classroom each day is not determining what your students are thinking, creating, writing, solving, discussing, reading, evaluating, comparing, or applying, but rather how you are thoughtfully responding to their work." We've had a seemingly endless list of projects to tackle at the Graide Network, but that's a good thing. Thanks to the team's ability to organize and prioritize tasks, we were able to accomplish a lot in the last half of 2016. "DonorsChoose.org is a crowdfunding platform for public education that connects citizen and corporate donors to public school classrooms throughout the country. The Graide Network is offering membership hours funded through DonorsChoose.org at a discounted rate." "While this process is still in progress, we’ve made considerable headway in the past couple months. In the rest of this post, I’ll outline what we’ve done to modernize our legacy codebase at The Graide Network, and hopefully this will help other developers who have inherited outdated or untested code." "So why did I have so much fun working at an ed tech company? My theory: because the Graide Network isn’t about Artificial Intelligence or making learning more isolated. It’s about the very human connections that can be made through technology. " Hot Off The Press: Official Graide Network Launch! After a successful pilot program in the 2015-16 school year, The Graide Network announced today that it will expand its services to teachers around the country this fall. Camelback Ventures is a fellowship program and seed fund that supports local entrepreneurs who are creating social impact, specifically entrepreneurs of color and women. Diversity is a criterion. In the venture capital world, just 2% of funding goes to black and Hispanic entrepreneurs and 8% to female entrepreneurs. There is a tremendous amount of work to be done to close this gap, and Camelback is leading the charge. Learn more about their amazing work!